Today marks the 64th anniversary of death Jake Atz, of one of the first Jewish players in Major League Baseball history. John Jacob Atz, born Jacob Henry Zimmerman in Washington, D.C. (born July 1, 1879 — May 22, 1945) was one of the first Jewish players in Major League Baseball. Early in his career he changed his name from Zimmerman to Atz. 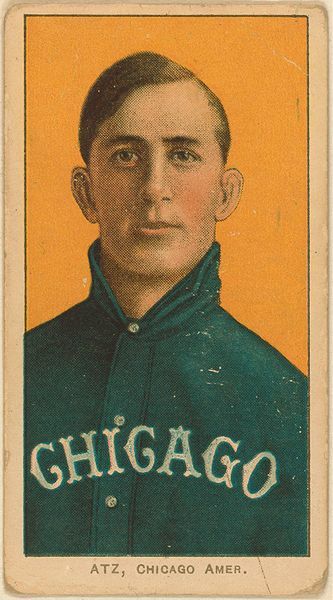 Atz was an second baseman for the Washington Senators (1902) and Chicago White Sox (1907-1909). He also was the most successful minor league managers of the 1920s, winning all or parts of the Texas League championship in seven consecutive seasons (1919-25) as skipper of the Fort Worth Panthers. In four major league seasons, he played in 209 games, had 605 at bats, 64 runs, 132 hits, 21 doubles, three triples, 49 RBIs, 23 stolen bases, 69 walks, a .218 batting average, .304 on-base percentage, .263 slugging percentage, and 33 sacrifice hits. Atz’ first managerial assignment was the Providence Grays of the East League in 1911, and he failed dismally, losing 69 of 108 games (.361). Three years later, in 1914, he took over Fort Worth. His Panthers had winning records in his first 13 seasons. During their seven-year skein as kings of the Texas League, the Panthers won over 100 games five times – with records of 108-40 (.730) in 1920, 107-51 (.677) in 1921, 109-43 (.717) in 1922, 109-41 (.727) in 1924, and 103-48 (.682) in 1925. In 1926, the Panthers fell to third and Atz would not win another pennant until 1939, with Henderson in the Class C East Texas League, three levels below the Texas League. His career record as a manager in the minors over 27 seasons was 1,972 wins, 1,619 losses (.549), still one of the best winning percentages among longtime minor league skippers. He died in New Orleans, Louisiana, at age 65. Let’s see how the the modern day Jewish ballplayers did yesterday. Brad didn’t play yesterday because the Dodgers were off. Ryan went 2-for-4, including his first triple of the year in yesterday’s Brewers win over the Astros. He drove in his 30th run of the year and scored his 31st run of the year – vert nice balance! His average rose to .326. But perhaps the highlight of his night was when threw out Astro’s first baseman Lance Berkman at home. Berkman didn’t like the call as was ejected by Umpire Delfin Colon. Ryan threw home and catcher Jason Kendall tagged Berkman as he slid and touched the plate with his left hand. When Berkman was called out he jumped and screamed in the umpire’s face. Astros Manager Cecil Cooper then ran out of the dugout, pushed Berkman away and started yelling at Colon, who took offense and ejected Cooper as well. Craig, 28, will be joining his fifth major league team. He was a surprise success in the Twins’ bullpen last season, posting a 1.63 ERA in 42 games after getting claimed off waivers from Cleveland. Until then, he was probably better known for his academic resume. As mentioned previously in this blog, Craig graduated from Yale and majored in molecular biophysics and biochemistry. The A’s had seven right-handed relievers and no lefties for Wednesday’s 7-6 victory over the Rays. Though Geren typically downplays the need for a lefty specialist, he acknowledged it will be convenient having that option with Breslow. Scott didn’t pitch in yesterday’s Rangers loss to the Tigers. John didn’t pitch in yesterday’s Pirates loss to the Nats. Gabe went 1-for-3, clubbing his 7th double of year, recorded an RBI and scored a run. All of Gabe’s action occurred in the 2nd inning, when he knocked in the Rays first run and scored their second run in their victory over the A’s. His average is now right on the Mendoza line, .200. Thus, Mario Mendoza’s card will remain. Ian went 1-for-5 and stole his 10th base of the year as the Rangers lost to the Tigers. His average fell to .295. Jason is scheduled to pitch this weekend in Detroit. Schoeneweis was back in suburban Phoenix, where his wife was found dead at their home Wednesday. Police said the cause of death hadn’t been determined. The pitcher released a statement late Thursday through his agent Scott Boras. Funeral services were scheduled for Monday at the Messenger Pinnacle Peak Mortuary in Scottsdale. The family asked that in lieu of flowers donations be made to the Ronald McDonald House of Phoenix. Schoeneweis left the team when he received the news before a doubleheader at Florida. He declined an offer to have teammate Jon Garland accompany him home. Hinch told the team 30 minutes before Wednesday’s doubleheader about the death of Schoeneweis’ wife, Gabrielle, who was 39. The couple celebrated their 10th anniversary in January and had three children together. The Diamondbacks and Marlins split a doubleheader that ended at 1:48 a.m., with Arizona winning the second game in 13 innings. Schoeneweis was placed on the bereavement list. The Diamondbacks were scheduled to conclude their series at Florida on Thursday before flying to Oakland for a weekend series. “It’s impossible for any of us to not think about Scott and his family,” Hinch said. “On the professional side, the schedule doesn’t stop. We have to play and find a way to play a baseball game time and time again. And the message Hinch texted to Schoeneweis? “Just letting him know we’re here and supporting him and thinking about him,” Hinch said. Hinch and Schoeneweis worked out together last offseason and have known each other since college, when they were Team USA teammates. Youk went 1-for-3, drove in a run, scored and walked in the BoSox victory over the Blue Jays. His average fell slightly to .402. Youk also earned a Chai 5.